Diamonds patented "ESCAPE PROOF" snap offers quick one-handed disconnects and advanced performance. No more fighting with and worrying about thin wire snaps. Diamond Fishing Products Swivels feature an advanced ball-bearing design that allows. . .
Corkscrew Ball Bearing Swivel - 600 LB. Test - Using this 'snap swivel' eliminates any chance of failure. Mostly used on dredge reels for an unbreakable connection. Sold Individually. Diamond Fishing Products Heavy Bullet Swivels are designed to work with our collection of DIAMOND Wind-On Leaders. 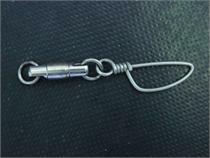 These swivels result in cleaner releases and less fish lost at the rail. Diamond Fishing Products Rotary Ball Bearing with Tournament Snap combines a heavy 304 stainless steel snap with our Rotary Ball Bearing Swivel. 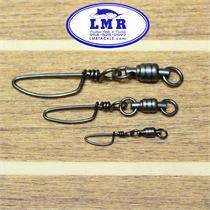 LMR Tackle custom hand made, stainless steel snaps are the best snaps money can buy. They are guaranteed to out-perform all other swivels. USA Made. Sold individually. 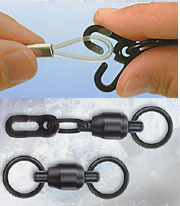 Many uses, deep dropping, kite ring stays, sword fishing, etc. Well tested and trusted. Sold individually. 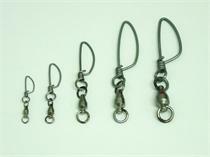 Black Hook Tackle ball bearing snap swivels are the best economical swivel that are well tested and trusted. Sold individually. 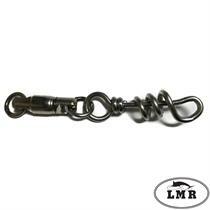 High quality rite angler barrel snap-swivel with a Rosco swivel. Sizes available: Casting, Dolphin, Sailfish, Marlin, & Tuna. 4/0 are 200 Pound Test. Used for wreck fishing, deep water live bait fishing. Just your reliable 3-Way Swivel. LMR Trusted.